Roasted autumn vegetables with sausage is the perfect super easy one pan meal! Post may contain affiliate links. I know. It’s 4 days until Christmas and I am posting an autumn vegetables post! That’s because I am still using up my fall veggies from my CSA. That’s the beauty of fall and winter vegetables, they are built to stand up to the cold and they last almost forever. I’ve stored butternut squash in my garage for months. I’ve lost a few along the way, but for the most part, they do quite well. I had some Brussels sprouts that I needed to use up. If I could find a recipe that used them and managed to make a dent in the rest of my vegetables that would be great. So, I searched my new latest and greatest find – Texture. I’m not going to say a whole about it in this post, because I love it so much that I plan to do a whole post on it! Basically it’s a magazine app for your phone or tablet. You can pay by the month or by the year for an all access pass to a whole slew of magazines. I was sold as soon as I saw their selection of cooking magazines. I found Roasted Autumn Vegetables with Chicken Sausage from Eating Well, the September/October 2015 issue. It sounded perfect and it was. What I loved about this recipe, besides the fact that it was a super easy one pan meal, was that it used rosemary and sage. I love roasting vegetables, but I almost always just toss them with olive oil, salt, and pepper. While they are good that way, the addition of the herbs just kicks them up a bit – and your house smells wonderful! I followed the recipe and used chicken sausages, which were already cooked. They came out of the oven all plump and appetizing, but by the time I got my photo taken, they had deflated a bit. I might change this up a bit and use Italian sausage and start them with the veggies at the very beginning. 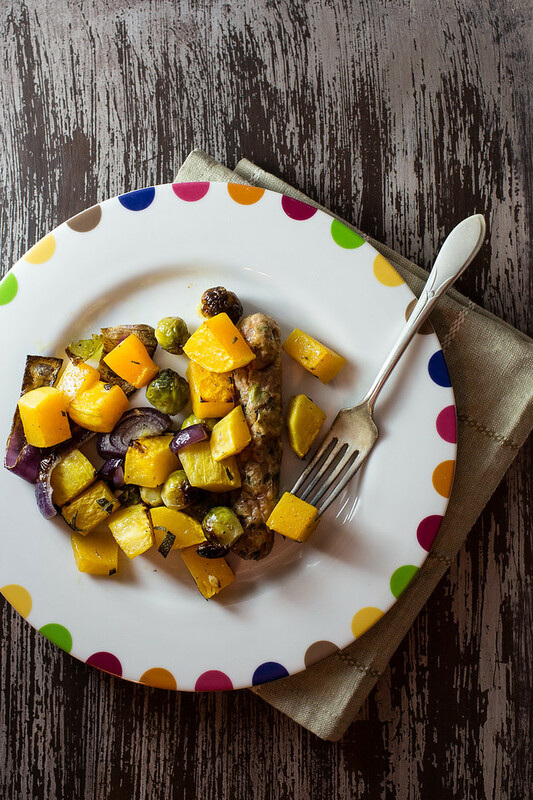 Butternut Squash, Brussels Sprouts and onions roast together with chicken sausage in this easy and healthy sheet pan dinner! Combine the butternut squash, Brussels sprouts, onions, garlic, olive oil, rosemary, sage, and salt and pepper in a large bowl. Toss and spread in a single layer on a baking sheet. Roast for 10 minutes. Stir the vegetables. Make room in the pan and add the sausages. Roast for 20 to 25 minutes more. Delicious and color full dish, thanks for sharing with Hearth and soul blog hop, pinning. Your Roasted Autumn Vegetables with Sausage looks fabulous. Thanks so much for sharing with us at Full Plate Thursday and hope you are having a great holiday season! It’s actually been rather cool and wet for Christmas week but I’d much rather this weather that the blistering 40 degC days we had last weekend. Looks like we will not only be able to cook a hot meal for Christmas but enjoy eating it! Merry Christmas! Haha, Pam!! I have all these veggies in my pantry/garage/countertop right now. Yay for CSAs!! I love taking root veggies and adding sausage. Can’t get any easier. This looks delicious. I need to make it! It is delicious! You’ll have to let me know if you make it!